Much like a marathon runner runs 26.2 miles, not 26 miles, I rode 373 miles this weekend. Not 360 miles, as I previously thought I was doing, but 373 miles! I did it with my supportive and strong friends Pat and Cecile, without them, I might still be out on the road. We completed the final brevette for qualifying for Paris brest Paris. 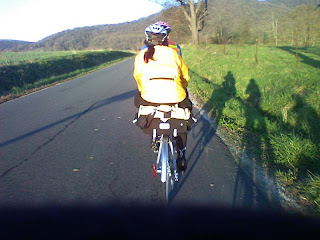 It is very interesting as the more miles we do, the more acclimated one becomes to being on a bike. 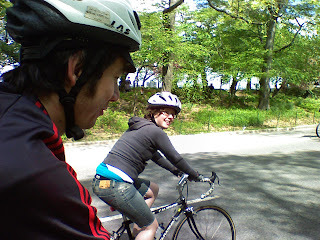 When I was younger, about 8-10 years ago now, I would do many shorter rides, averaging at least 100-150 miles a week, usually more in the summer. All of that shorter riding fails in comparison to the mental and physical test these ultra distances put on you body. The amount of time you are sitting on the seat, just pedalling away, seems so ludicrous when you have not done anything like that before. The overall time this weekend on and off the bike to complete the route was 35 hours and 55 minutes. We stopped in Sommers Point, showered, and slept for 3 hours, and then were back on our bikes before sunrise. 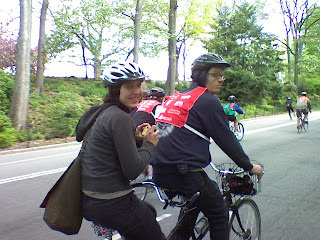 The ride began at 4am from Hightstown, New Jersey, near Princeton. The route basically went south to the southern most points and then returned back up north. Saturday's ride was surprisingly undifficult, I do not say easy as we did ride 240+ miles that day in the 90 degree heat, but it could have been worse. I was rather out of it by the time we rolled into the motel at 1am., from the heat, not eating anything of substance and the developing saddle sore. We had first planned on sleeping until 5am and leave at 6am, but Pat couldn't sleep and we were up around 4am and decided to leave at 5am. 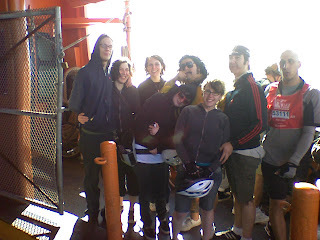 We felt bad that we had made plans to ride with some people that we previously rode in with, but there was no sense of wasting an hour just waiting for them. 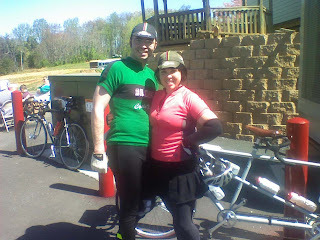 Sunday was great, tailwind, overcast and the high temperature was in the 70s. Perfect relief from the previous day of hot sun, and headwinds. Towards the end of the ride, my body was really feeling the mileage under it, but with the help of the "carrot stick"-pat and cecile- I was able to ride it out. I am left today with a real sense of accomplishment, and a better understanding of what my body can endure, and the fact that one can push themselves so much further than one might ever imagine. There were many times in my head I needed, not just wanted to stop, but I pushed on and was able to muster the strength from somewhere. I joked many times about finding my "third or fourth wind," as on a long ride, you have your highs and lows, and you just keep on pedaling. Today we leave for the long drive out west to Ohio for the swap meet at Memory Lane Classics. It is held the field around there bicycle shop in Grand Rapids. Some years the weather has been beautiful, other years we have been stuck with freezing rain. This weekend doesn't look too bad, with only scattered thunderstorms. The weather is an important factor for any swap meet, but I look at the forecast even closer as I know I am in that field from Thursday night until Saturday afternoon. We either sleep in the van or if the weather permits it, out in the field, under the stars. After Memory Lane, we drive up to Ann Arbor Michigan to half indoor/half outdoor swap meet there on Sunday morning. That starts with the getting there early on Sunday morning to seat on line in our vehicles before sunrise, waiting for the gates to open at 7am? From there, we spend all day buying, selling, looking, and smoozing. 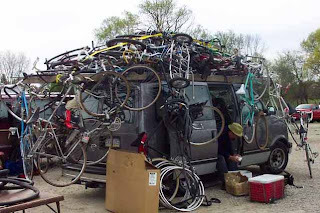 Last year the van was pretty loaded and people we coming over and taking pictures of our "pile." 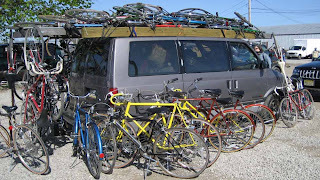 Every bicycle, frame, and part in the picture is something we bought while out west last year. Doing quick errands around here in Philly only makes sense to do it by bicycle. I choose to do it on a 1961 all chrome Rudge that has been retrofitted with Campagnolo cranks, Velocity 700c wheels, Panaracer T-Serve tires, Brooks B-72 saddle and a Union bottom bracket generator. 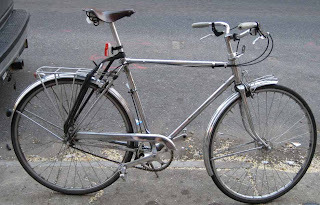 I know the frame is too small for me, but it is really hard to find a vintage chrome bicycle. It is great for getting around town, you don't need more than three speeds for center city. The fenders and chainguard keep me clean and the rear rack and innertube are good for carrying things. Ideally I would want some larger front rack, but for now, I have a cosmetic one, a TA made rack attached to a Mafac Racer brake. 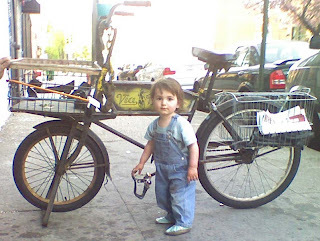 Curtis rides a Prewar Schwinn Cycle Truck with a modified laundry basket on the front and double rear baskets on the rear. It has an inch pitch drive that is geared super low, great for carrying large loads or getting in shape, read:spin. Curtis uses it for lugging groceries, taking packages to the post office and transporting Fido, the shop dog. Also great to BBQ off of. In the CycleTruck picture is the newest member to push a broom around, Curtis the third. It is a good size load for one person to have to load up, looks like I didn't miss too much. 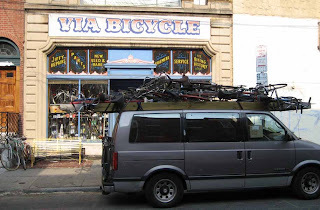 I still have not seen the contents but the van looks like it only have 10 bikes on the outside, not that much considering the loads we have previously packed. Today we get to unpack the van and see what goodies Curtis bought and traded and see what undesirables returned with him. It is always fun to see what turns up at swap meets because there is always something unique and cool. This was the first swap meet I have missed in a while, maybe a couple of years? Curtis was left to haggle and purchase bikes on his own, rather than our method of swooping down on a swap meet, 'attacking' from two different sides to get the early deals. From my talks with him over the weekend, it sounded successful, for the first time in a long time, he actually brought items to sell and said they sold well- or more importantly- they did not return with him. I have a lot of packing of Ebay and website items today, as a bunch of stuff sold over the weekend. I also have to start preparing myself for the trip out to Ohio and Michigan for those swap meets this weekend. As fun as swap meets are, they are also taxing on the body and mind. 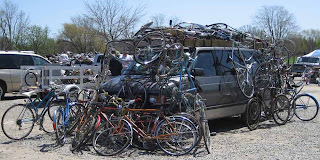 It is usually a sensory overload, looking at thousands of items, hundreds of bicycles and knowing what the value is to the shop and trying to buy them cheap enough so they can be sold at a reasonable price with room for a little profit. 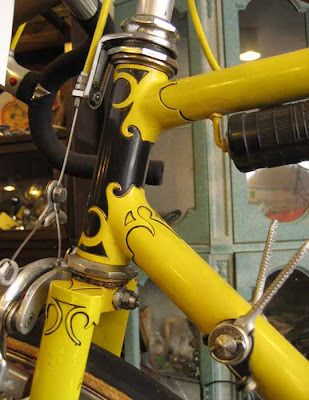 I must know the approximate value of a Campagnolo Super record used track headset, lamp bracket to a 1920s Mead Ranger, left Tear Drop pedal, Schwinn Sports Tourer, and a VAR 4th hand tool. One day is cool, but two days is taxing, and the third day in Michigan just really wears me down. All of this does not take into account the talking with collectors and smoozing I do as well, and the 'occasional' beer or two! 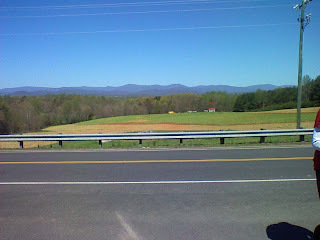 It was an ideal day for riding on the April 21st, and Virginia was beautiful. We started the ride with less than ideal conditions though, after taking the long way there, 5 hours of driving, rather than 3. I think I ate a Snickers candy bar for dinner. To top all that, we only slept about 3 hours. 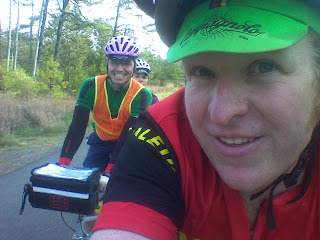 With all of that working against us, the ride started well, at a brisk 5am. Our Schmidt lights and hubs were more than sufficient for the darker than night back roads. It was my first night ride with my current setup and I was really pleased. As day broke, we could see the landscape and knew it was going to be a very enjoyable ride. Rolling countrysides and plenty of cows to moo at and horses to neigh with. 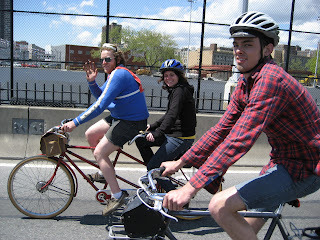 My riding buddies were fellow Philadelphians Pat and Cecile on a custom Bilenky tandem. 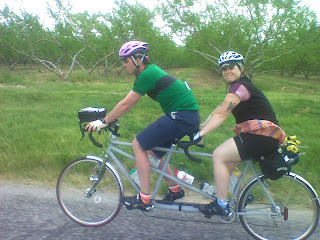 They borrowed an ill-fitting tandem a few weeks before to ride the 200k in Eastern Pennsylvania and decided that a tandem was the best way to go to get to Paris. Their tandem for this ride was not even painted, just primered with Bilenky written on it with magic marker! No mechanical problems for either bikes, my Jack Taylor is excellent for longer distances. No pictures of my bike yet, or me, as I am the cameraman. The route was all rolling hills, nothing compared to the climbs we encountered on the 200k. We finished a little before 10pm, getting another chance to try out our bomb-proof lighting setups and our navigational skills at night. I was left with a slightly sore knee and some irregular sunburn patches from the irregular applications of sunblock I used. Other than that, the ride was perfect, not one missed turn(a few slight overshoots, but we always caught them), no mechanicals, food was excellent, enough water and an abundance of waving Virginians, leaving my bell ringing thumb well exercised! These are just a couple pictures on the computer of some things we have around the shop. It is my first post and I hope to add valuable information up here in the future. But for now, look at the pretty pictures and ask any questions you may have. First photo is of a 1959 Ephgrave. 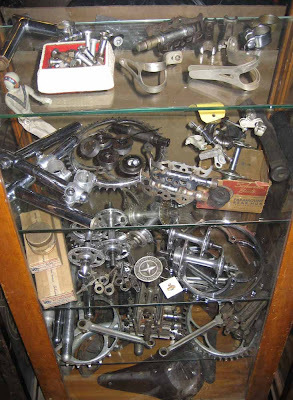 Second is a Schwinn Paramount display. 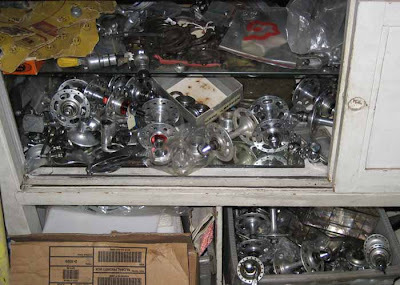 Third is an assortment of hubs, from Maxicar to Campagnolo to Zeus and others. 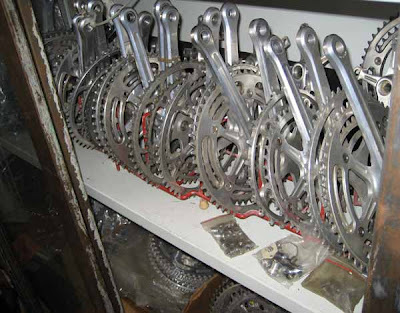 Final picture is of a pile of Campagnolo cranks. My boss is away today at the Copake Swap meet and Auction, and tomorrow I take off work to do a 300k brevette, for the second, out of four, qualifying rides for Paris-Brest-Paris. It will be fun. I am riding a 1968 Jack Taylor that I received as a gift from my boss. I will photograph it soon, with a description.